Welcome to Analogue Dreamscapes. Within you'll find a diverse assortment of thick, textured and atmospheric sounds that can be weaved together to bring a stunning and forward thinking sound to the forefront of your music. The contents of this one are 100% royalty free; grab it while it's fresh! 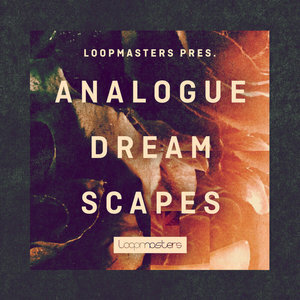 Making way with over 2 GB of content, Analogue Dreamscapes is the perfect addition to your downtempo and cinematic outings, but also rolls well in a dancefloor context. You?ll be generating pure ambience and vibes with the included cinematic synth loops, house drum samples, techno inspired FX percussion loops, ambient synth chord one-shots, arps, basses, FX and much more, all primed for use in your next experimental excursion. With loops rocking out at 120bpm, this collection works well in a variety of contexts. Downtempo, chillout, Synthwave, ambient and melodic electronica settings will serve this collection well, but also more musical takes on house, techno and other dancefloor styles. In detail, expect to find 2.26 GB of content with all audio recorded at 24Bit & 44.1 kHz. 344 loops are broken down as 55 synth loops, 52 percussion loops, 48 bass loops, 33 arp loops, 32 synth chord loops, 26 kick loops, 26 full drum loops, 21 top loops, 18 hat loops, 12 clap loops, 10 perc FX loops, 6 ride loops and 5 snare loops. 481 one-shots are divided into 170 drum hits, 81 synth hits, 63 bass hits, 16 FX, 4 Bass multis and 4 synth multis. Also included are 494 Rex2 Files, 170 soft sampler patches (for NNXT, EXS24, Kontakt, Halion and Sfz), 107 Midi files and 8 Kong. Analogue Dreamscapes is available now to bring beauty and wonder to your mixdowns!